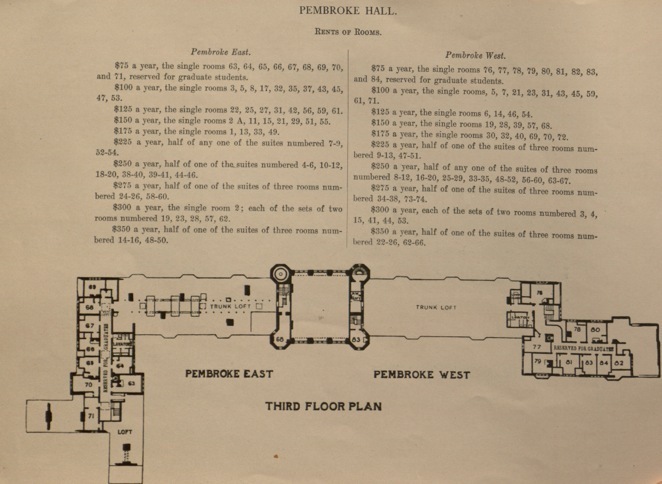 From "Academic Plans and Buildings," Pembroke Hall's pricing and layout. In about one-sixth of the college rooms the rent is $100, making the cost of board, residence, and tutition for undergraduate students $500; but students desiring to apply for rooms at $100 must file a statement at the president's office that they are unable to afford rooms at a higher price. The publicness of this declaration (as, while it is made to the president's office, this request in conjunction with the floorplans could easily determine who would be paying the lowest rate with demonstrated need) suggests that even within in the Bryn Mawr community there were varied degrees of access.